American Red Cross Lifeguard Certification provides lifeguard participants with the knowledge and skills to prevent, recognize and respond to aquatic emergencies and to provide care for breathing and cardiac emergencies, injuries and sudden illnesses until emergency medical services (EMS) personnel take over. Upon successful Lifeguard Training course completion participants will receive American Red Cross certifications in Lifeguarding, First Aid and CPR/AED for the Professional Rescuer valid for 2 years. 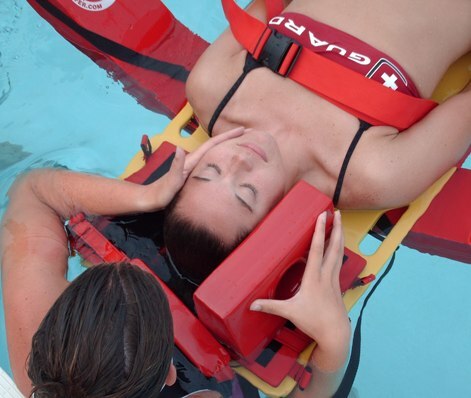 American Red Cross Lifeguard Review provides currently certified lifeguards the opportunity to review the new Lifeguard course materials/skills and renew their certification. Upon successful completion of the Lifeguard Review candidates will receive American Red Cross certifications in Lifeguarding, First Aid and CPR/AED for the Professional Rescuer valid for 2 years. American Red Cross Lifeguard Instructor Program (R.12) Lifeguard Instructor candidates must be at least 17 years of age and possess a current American Red Cross Lifeguarding certificate. Upon successful course completion, Lifeguard Instructor candidates will receive an American Red Cross Lifeguard Instructor certificate valid for 2 years. Water Safety Instructor candidates must be at least 16 years of age, able to demonstrate proficiency in six strokes Front crawl (freestyle), back crawl (backstroke), elementary backstroke, sidestroke, breaststroke, and butterfly – 25 yards per stroke and tread water for 1 minute. Upon successful course completion, Water Safety Instructor candidates will receive an American Red Cross Water Safety Instructor (WSI) certificate valid for 2 years.